Make sure you stop by the One Stop Craft Challenge and check out all the lovely cards made by the Design Team. This weeks challenge is Fairies or Angels. We would love to see what you make. I made a card using an OSAAT (One Stitch at a Time) image called "Garden Fantasy". You can get this stamp here. Since this image was blacked out I decided to make the background colorful using Copic markers. The image was traced in several colors of Copic Spica markers to give the card some sparkle. This is so beautiful, Dawn! I love the colored background and the added sparkle! Gorgeous card Dawn!!! So glad you have joined us at the Creative Card crew. Look forward to seeing more of your work now that I have become a follower of your blog. Hi Dawn :) I think this is gorgeous. Such beautiful colours, it looks amazing. Great sentiment too - its just wonderful. Gorgeous silhouette and matching sentiment. Thanks so much for playing along at The Play Date Cafe. Dawn, you've created such a neat scene here with the fairy and those nighttime-sky colors. THanks for playing along with us at The Play Date CAfe! 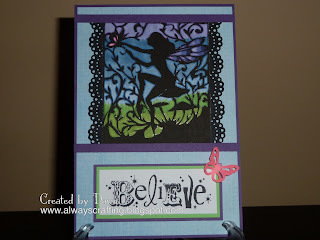 Beautiful image and lovely border punch! So glad to have you playing along with us this week at the Play Date Cafe! Great card for a teen, love the funky image. Very pretty card, great use of our colours. I love your sentiment font too! Thanks for playing along with at the Play Date Cafe this week!